Schwegler Birdhouses Proven in Europe for over 40 years 10" high x 6" diameter, 15" overall inc. hanger, 8 lbs. 1-1/4" hole for wrens, chickadees, nuthatches, titmice, small woodpeckers. 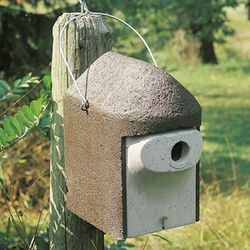 Schwegler Birdhouses Proven in Europe for over 40 years 10" high x 6" diameter, 15" overall inc. hanger, 8 lbs. 1-1/2" hole for Eastern Bluebirds, tree swallows. 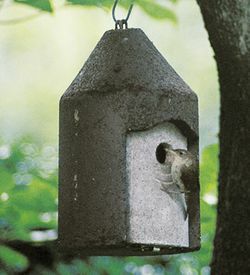 Schwegler Birdhouses Proven in Europe for over 40 years 1" hole-Made specifically for American house wrens. 10-1/2" high x 6-1/2" diameter, 23" overall inc. hanger, 8 lbs. Schwegler Birdhouses Proven in Europe for over 40 years Long reach from front of box puts nest at rear beyond reach of cats or squirrels. 11-1/2" high, 7" wide, 9-1/2" long. 18" overall inc. hanger, 14 lbs. 1-1/4" hole for wrens, chickadees, nuthatches, titmice, small woodpeckers. 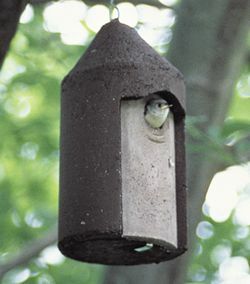 Schwegler Birdhouses Proven in Europe for over 40 years Long reach from front of box puts nest at rear beyond reach of cats or squirrels. 11-1/2" high, 7" wide, 9-1/2" long. 18" overall inc. hanger, 14 lbs. 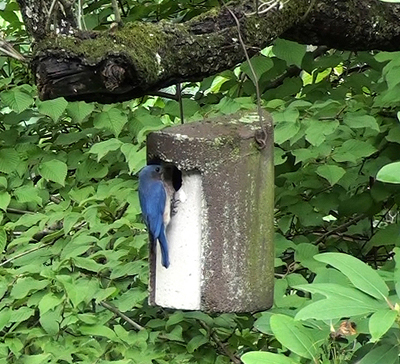 1-1/2" hole for Eastern Bluebirds, tree swallows. Schwegler Birdhouses Proven in Europe for over 40 years 13" high x 6-1/2" diameter, 26" overall inc. hanger, 8 lbs. 1-1/4" hole for Wrens, chickadees, nuthatches, titmice, small woodpeckers. Schwegler Birdhouses Proven in Europe for over 40 years 13" high x 6-1/2" diameter, 26" overall inc. hanger, 8 lbs. 1-1/2" hole for Eastern Bluebird, tree swallows.